Compress and expand your drums - at the same time! A new and effective approach to shaping dynamics, Drum Leveler does take a bit of getting used to, but the interface is excellent and the results are top notch. Novel dynamics concept. Clean, precise results. Clear display and threshold settings. Great for blended drums and beats. Sidechain filter. Usable on any transient-heavy signal. Doesn't replace traditional dynamics plugins. Drum Leveler is, as the name suggests, a plugin (VST/AU/AAX/RTAS) focused on the levelling of drum tracks. However, like Sound Radix's previous plugins, this is no ordinary dynamics processor. Drum Leveler employs beat detection to analyse the signal, then applies simultaneous upward and downward compression/expansion on a hit-by-hit basis. Rather than offering traditional threshold and ratio settings, it combines two thresholds (Hi and Lo) with a Target level and Compression amount (+/-0 to 100%). Lo works much like a typical compressor threshold, while Hi acts as an upper level limit. "Drum Leveler does a great job of levelling user-targeted beats and it's surprisingly easy to get to grips with"
Together they define a signal level range within which beats can be targeted. The Compression amount sets the percentage by which any beat falling within this range will have gain individually applied to it to match the Target Level, 100% representing a 1:1 mapping. Further to that, negative Compression settings result in expansion. For fine-tuning the process, there's a fully adjustable sidechain filter with band-pass and band stop options, and separate high and low frequency settings. Four further controls flank the Compression knob, too: Gain Range puts a cap on the gain applied (0-80dB), while Minimum Retrigger sets a minimum time (0-500ms) before the detection algorithm is allowed to detect the next discrete beat. Hold Time and Recovery Time both influence how long the gain change is applied for. Drum Leveler includes Dual Mono, Stereo and M/S operation, and a zoomable, colour-coded waveform display which indicates gain changes. Not only does Drum Leveler do a great job of levelling user-targeted beats, it's also surprisingly easy to get to grips with. The adjustment of the three levelling parameters - Hi Threshold, Lo Threshold and Target Level - directly in the main waveform display makes pinpointing thresholds a doddle; and thanks to the colour coding, you can easily see any gain change and whether it's positive or negative. On a full drum kit mix, it's quite possible to reduce or even totally notch out individual hits. At the other end of the usage scale, if you want to boost levels for specific beats, that's an option, too. The Hold and Recovery settings have a considerable influence on how Drum Leveler sounds, and much like the release stage on a regular compressor, with time spent here, you can achieve everything from heavy, gate-like pumping to smooth, transparent gain reduction. There are times when Drum Leveler catches beats you don't want it to, but we found that when their frequency content is specific enough, the sidechain filter can help. We also tried the plugin on other transient-heavy sounds, such as picked electric bass and guitar, and found it surprisingly effective at sorting out tricky or problem transients. Nevertheless, Drum Leveler's forte is clearly 'mixed' material (ie, a mixed drum kit recording), with which other traditional dynamics processors struggle to isolate elements. 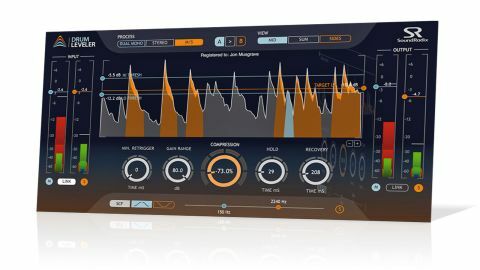 Sound Radix's innovative new plugin does require you to rewire your brain a little, but that doesn't take long, and once you've got used to its approach, it's a really great tool that neatly sidesteps many of the frustrations of conventional level-based dynamics processing.